After a busy summer, things do not seem to be slowing down for Hi-Wire Brewing. With production in full swing, Hi-Wire Brewing is excited to announce the release of four beers in the upcoming month. 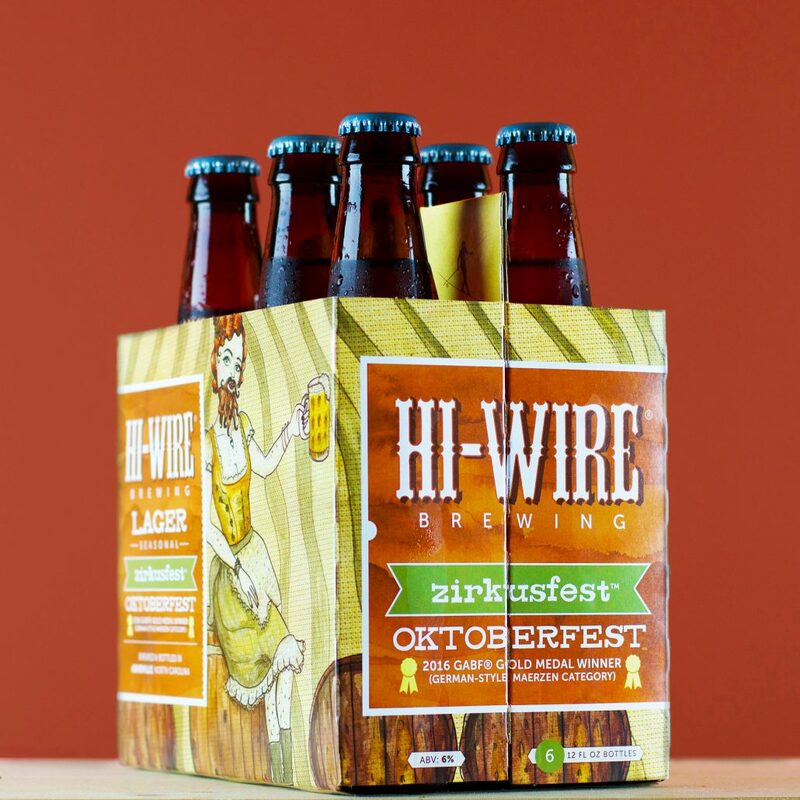 Taking home the Gold Medal at the 2016 Great American Beer Festival in the German-Style Maerzen beer-style category, customers will be able to enjoy Hi-Wire Brewing’s Zirkusfest Oktoberfest (6% ABV) beginning the first week of August. Zirkusfest is a traditional Maerzen that boasts all the flavors one wants in a rich Oktoberfest lager without the heavy finish. The use of Munich malt provides upfront biscuity and honey flavors that fade into a dry finish. Zirkusfest Oktoberfest will be available on draught and in six-packs throughout Hi-Wire Brewing’s entire distribution footprint, as well as both of Hi-Wire’s taprooms. For the fifth year in a row, Hi-Wire Brewing will be releasing Lion Tamer Rye IPA (7% ABV). This popular ale seasonal is aggressively hopped with a blend of citrus-forward Citra and Amarillo hops. Ruby red in color, Lion Tamer’s citrus fruit flavors are rounded out by the unmistakable spice bite of rye. Also available in six-packs and on draft, this beer will see Hi-Wire’s entire footprint beginning July 28. Coming out of their Specialty program for the first time this fall is Hi-Wire Brewing’s Southern Hemisphere IPA (7% ABV). With hops from New Zealand and Australia, join Hi-Wire Brewing on an exploration of southern hops in this aromatic and drinkable India pale ale. Notes of green melon, juicy cantaloupe, and piney resin balance perfectly with a firm bitterness that doesn’t linger and finishes dry. Available in 4-packs of 16oz cans, Southern Hemisphere IPA will see limited distribution in Hi-Wire Brewing’s entire footprint beginning August 14. Lastly, Hi-Wire Brewing will be releasing their much anticipated Apricot Sour Ale (8.5% ABV) Saturday, August 5 at 12pm from their South Slope facility | 197 Hilliard Ave. With upfront sourness, this beer is balanced with apricot sweetness before finishing dry and oaky from red-wine barrels. With a total fermentation time of 11 months, this sour ale will be available in 750ml bottles and will see limited distribution the second week of August.